Pavo, the peacock, is a modern constellation created by Johann Bayer and published in 1603 in his famous Uranometria atlas. Modern though it is, he perhaps thought of the famous Argus Panoptes (the all seeing Argus) of one hundred eyes, tasked with guarding Io when... but I get ahead of myself. Io, sometimes called Callithyia, was the chief priestess of Hera. Hera's husband, Zeus, fell in love with her, and changed her into a white heifer to protect her from his jealous wife. Hera is many things, but she is not stupid. She persuaded Zeus to give her the cow, and tasked Argus Panoptes to guard her. Argus was a little different from you and me; he was a giant covered with one hundred eyes from head to foot. Zeus, unhappy with this arrangement, sent fleet-footed Hermes to lull the creature to sleep and kill it. Hera took Argus' eyes and placed them on the tail of the peacock. Hera, never one to give up, sent a gadfly to torment Io, who wandered over all the earth trying to escape her tormenter. She crossed the Ionian Sea, swam the Bosphorus (the ford of the Ox), and reached Egypt, where she again became human, and bore a son named Epaphus. We often identify Io with the Egyptian goddess Isis. Hera later carried off Epaphus to Byblos in Syria. Io searched for him and found him, and she merged there with the Canaanite goddess Astarte. As for the unfortunate Argus Panoptes, peacocks run wild in certain places on Oahu in Hawaii, including one of the HAS viewing sites. Their haunting calls echo frequently off the mountains as the stars wheel overhead. Each map can be clicked on to produce a 916x1200 version of it. They sport red labels, which look good on screen, but which disappear when used with red flashlights. Each map, therefore has a second link to a map better suited for printing in a graphics program, and using in the field. While they are quite large, they are all about 30-35k, and so are easy to view at today's modem speeds. The first map is a wide area view of the constellation, suitable for naked eye browsing. The next views are binocular width, showing stars to mag. 10, deepsky objects to mag. 12.9, and labeling deepsky objects to magnitude 12. 77k JPEG. 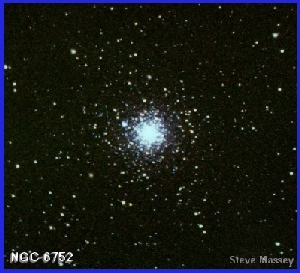 Perhaps the third best globular in the sky (behind Omega Centauri and 47 Tucanae, and a rival to M22), NGC6752 (Bennett 121, Caldwell 93) is called bright (mag. 5.4), very large (20'), and less round than some globulars. You can see stars visible from mag. 11-16. It sits 3.1° NE of Lambda Pavonis. Image by Steve Massey. This is a 10 minute exposure taken with Konica 1600 through a 10" Newtonian. 13k JPEG. 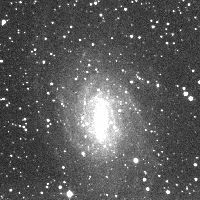 NGC6744 (Bennett 120, Caldwell 101) is a barred spiral galaxy located 2.6° ESE of Lambda Pavonis. Dreyer calls it quite bright, quite large, round (actually it's tipped at about 45° to us), it has a suddenly brightening to the core. He also calls it somewhat resolvable, meaning it should look mottled in a 10" under dark skies. Copyrighted photo by Gordon Garradd, taken through a 10", f4.1 Newtonian, and used with permission.